An evening to explore what comes before we can make use of technology Technology is shaping how we do things for example how we go shopping, how we communicate with eachother, how we diagnose illnesses or how we collaborate and with whom on projects. The ability to extend our power of human thought with digital tools has become an essential part of our everyday lives and work. We all need to understand how, when, and where computers and other digital tools can help us solve problems, and we all need to know how to communicate with others who can assist us with computer-supported solutions. 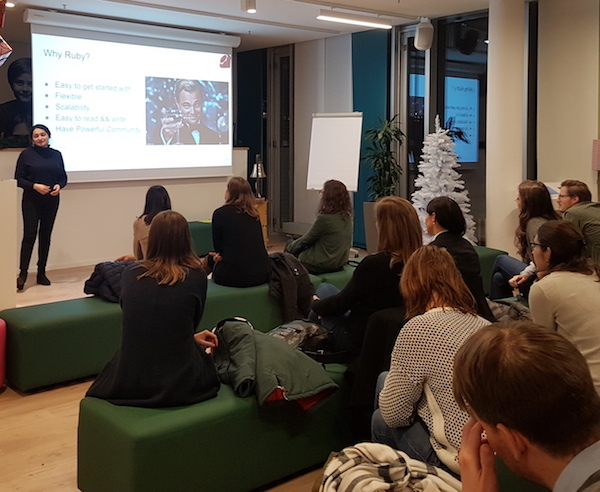 Our first community event with Airbus March 15th, 2019 Last Friday, we had the pleasure of hosting our first ever meet-up at the ZAL Centre of Aeronautical Research in Hamburg together with our new partner Airbus. Despite the stormy weather, we had a packed out room full of fellow Women Techmakers who were eager to hear inspirational stories and network. Networking and guided tour through the Airbus Protospace The evening kicked off with introductions and a welcome speech from our Airbus team which was followed shortly after by a guided tour of the Airbus ProtoSpace. Hi Mamta, could you tell us a little bit about yourself? I’m Mamta Vuppu originally from India settled in Germany. 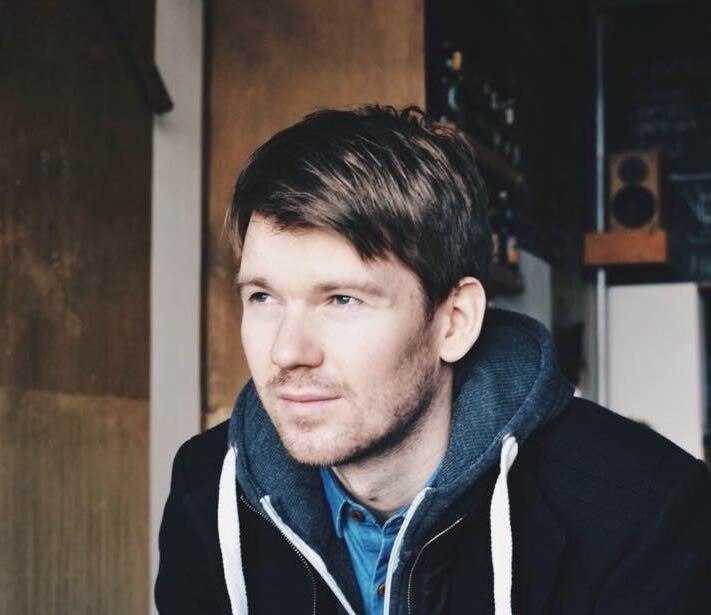 I have been working in the IT industry for over a decade, and I currently work as an information security consultant in Hamburg. 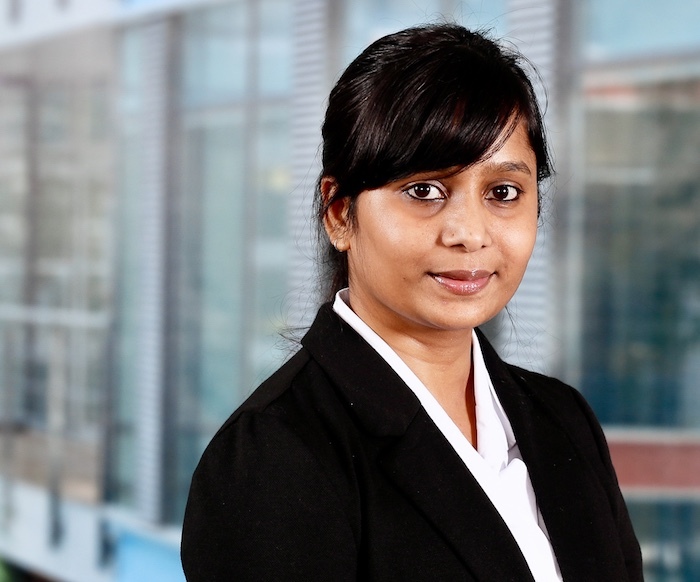 As an information security consultant my day to day work involves analysing client’s IT environment for any risks or security gaps and implementing solutions based on the industry standards using state of the art technology. 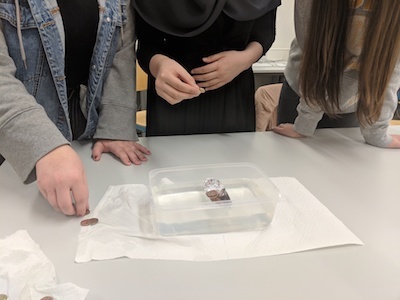 moinschool at the district school Alter Teichweg On 06.02.2019 the second round of project moinschool started at another school in Hamburg. moinschool has set the goal to inspire young girls for IT and to show them that technology is not only for boys. Especially during school time, when young people get information about their professional future and are shown their strengths and weaknesses, there are still big hurdles that prevent girls from getting interested in technical professions. 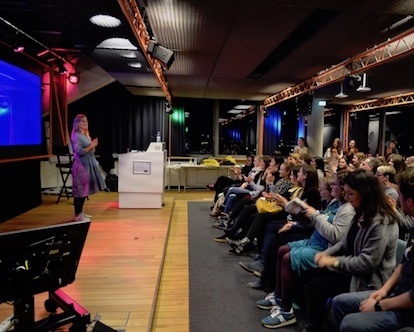 Some impressions from our kick off in Hamburg last thursday at the Google Office We met last Thursday to find out what happened to the Women Techmaker Meetup three years after it was founded. Meanwhile the Meetup has over 2600 members in Hamburg and we have founded a non-profit association called moinworld e.V. to get even more women excited about IT. Since the association was founded two years ago, there have not only been the well-known Meetups, which usually take place every two weeks, but also programming courses in which you can learn to code in a structured way. In 2019, I’m going to… lose weight work out more drink less …learn to code?! It’s January 2019. No New Year’s resolutions? No problem! Forget the usual resolutions of hitting the gym or starting to detox! Why not embrace coding with moinworld? Learn a new skill, meet new people and become part of tech community of over two thousand people in Germany. We want women to become more confident and better represented in tech, so we have courses suitable for all levels and ages. The award honours initiatives that introduce information technology topics in schools, vocational training and universities. “The IT skills shortage is hampering innovation, digitisation and growth in the Hamburg metropolitan region,” says Raphael Vaino, explaining the background to the award, which is therefore looking for initiatives that promote sustained interest and competence among children, young people and young adults. 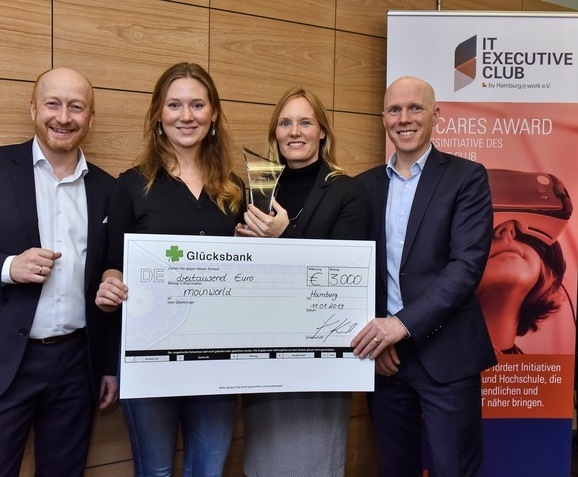 moinworld has taken 1st place at this year’s “ITEC Cares Award” of the IT-Executive Club of Hamburg@work. Learn to code in Hamburg’s schools We started our project moinschool with one idea in mind: to take away the fear and “I can’t do this” attitude girls have towards technology. As Marrie Curie said, “you don’t have to be afraid, you just have to understand everything”. We wanted to give the girls a chance to understand how programming works, and to encourage them to become creators of their future worlds, not just mere users. 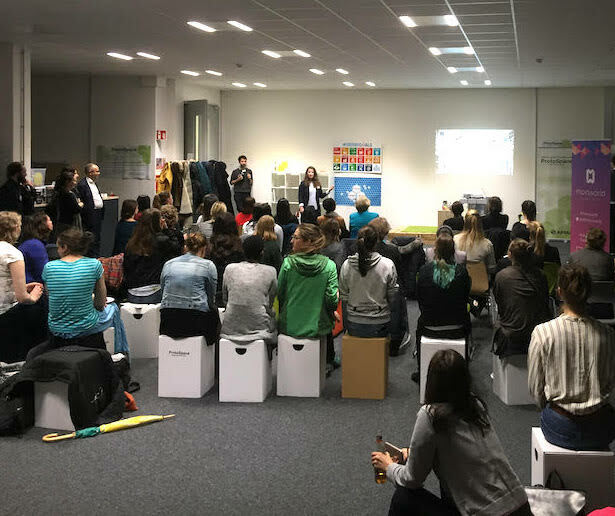 Women Techmakers Hamburg to moinworld Hi I am Florian. I was already a part of the community when it just started out as the Women Techmakers Meetup. 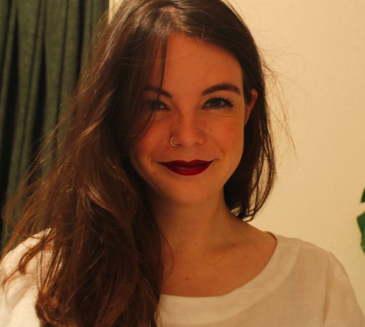 I think Diversity is important in any field and I like contributing to making a change. I am a software developer and have been interested in computers since I was a child of around 5 years old. The first topics that caught my interest were computer game, which then made me want to learn more about computers in general.